Second Group Winner For First Season Sire Tamayuz. 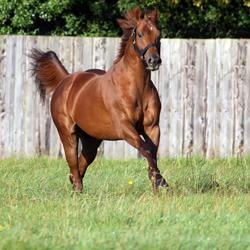 Sir Prancealot, who already had won the National Stakes (Listed Race) at Sandown on the 27th of July started favourite in the Group 2 Flying Childers over 5 furlongs on the 14th of September. The good looking son of Tamayuz showed his class inside the final furlong to beat Bungle Inthejungle and Sound Of Guns easily in end. Richard Hannon jnr said after “He is in the Middle Park and i think he will run a big race. He has a got a great attitude and an awful lot of ability”. Bred by Dermot Cantillon and Forenaughts Stud, Sir Prancealot was sold in the Goffs November Foal sale for €52,000 and then resold in the Goffs Orby yearling sale for €140,000. He was bought by Peter and Ross Doyle Bloodstock on behalf of Andrew Tinkler. Sir Prancealot is out of the Listed winning Catrail mare Mona Em, making him a half-brother to Listed winner Nice Applause. Mona Em was covered in 2011 by another Derrinstown Stallion Arcano. Meiner Eternel got Tamayuz another Group win when he landed the Group 3 Kokura Nisai Stakes at Kokura over 6 furlongs, securing around €300,000 for his connections.Meiner Eternal is out of the Piccolo mare For Evva Silca and was a 150,000gns purchase last year.